This is a blog post by aaron cope that was published on December 03, 2018 . It was tagged exhibitions, opendata, whosonfirst and airlines. 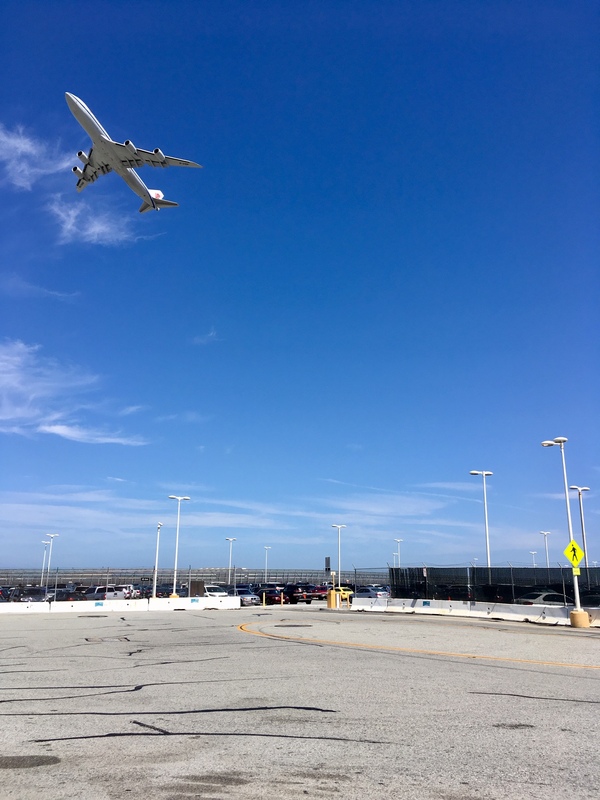 To ensure that every aspect of a trip to SFO, and every facet of someone’s time spent in the airport, leads back to the museum’s collection. 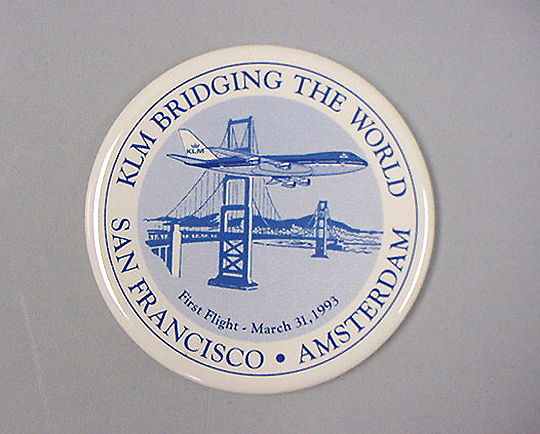 SFO Museum is actually a museum, with both temporary and permanent collections, and a library and an archive. These are all important and meaningful distinctions to people who work in the cultural heritage sector. The distinctions represent unique areas of focus, expertise and responsibility. At the same time people not working in the cultural heritage, and busy being awesome in their own endeavours, don’t split these particular hairs the same way we do so when I talk about “the collection” I am talking about everything that SFO Museum does, everything that we produce, everything that we care for. 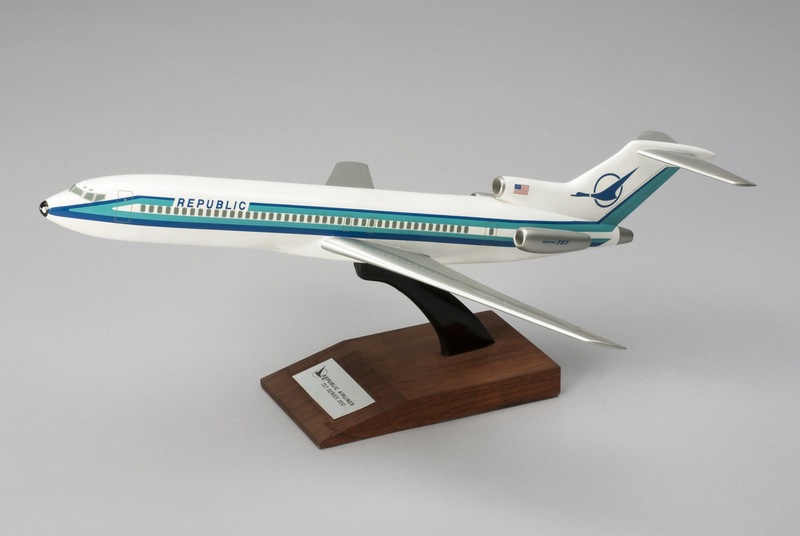 The lovely thing about a museum like ours is that the visitors, all the places they travel to and from and airplanes and airlines that are taking them are the glue that connects the museum’s different efforts. This is especially true of the museum’s permanent collection whose focus is “the history of commercial air transport, the airline industry, and San Francisco International Airport with a regional emphasis on the West Coast and the Pacific Rim” and the temporary exhibitions which are a delightful mix of everything under the sun and are composed largely of objects borrowed from public and private lenders. Place and travel connect them since every-thing is from some-place and people, the passengers and visitors passing through the airport, are what connect travel and place. That’s why we’ve started our efforts at the macro level, with maps of the world and the infrastructure to sustain them, and have been getting closer and closer to the micro level, the objects in our collection, with work to model buildings down to individual galleries. 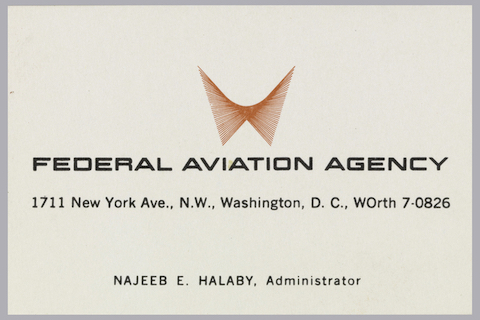 To that end we’ve updated the Mills Field website and our publicly available datasets to include two more “first-class” actors in how the museum understands its work: Airlines and Companies. Actually, it’s really airlines and companies and agencies to account for things like NASA or a national postal service. enterprise must have a bold leader"
This is relevant because like all the other datasets we’ve published we’ve modeled “enterprises” as Who’s On First documents. Which, let’s be clear, is not really what Who’s On First was designed for. This is SFO Museum piggy-backing on an existing project and then starting to push it in new directions to suit our needs. Who’s On First was created to tackle the problem of place, not of things or topics or of human enterprise. Still most activity can, at some level, be localized to place even if it’s something as mundane or uninspiring as where a company is headquartered or where it file income taxes. For example, regardless of where anything that Apple sells is actually manufactured (and it’s an open question whether or not that includes the USA) those products are said to be “designed in California”. It also helps that airlines fly to … well, places. So what we’ve said is that an airline, or a company or an agency (an enterprise) is “parented” by the place that it is “from” which means a locality or at least a country. For example Continental Airlines is parented by the city of Houston and African Safari Airways is parented by the country of Kenya. It also means we can quickly and easily show you all the airlines from Bangladesh or any of the other countries that intersect with our collection. SFO Museum distinguishes between airlines and companies partly to reflect how the curators and registrars have thought about this in the past and also to reflect the reality that in an era of multinational companies and conglomerates individual airlines are just facets of a larger whole. British Airways, Aer Lingus and Iberia, among others, are all distinct airlines that people know and recognize that also happen to be owned by something called International Airlines Group which has never graced an airport departures board, so far as I know. We see the same thing happening in the museum sector. MoMA is no longer just a single museum, but a museum and a second museum in Queens and a number of stores in New York City and Japan. The same is true of the Metropolitan Museum of Art with its three museums in New York or the Smithsonian with its many “units” (that’s really what they call them…) on The Mall in Washington. The list goes on. 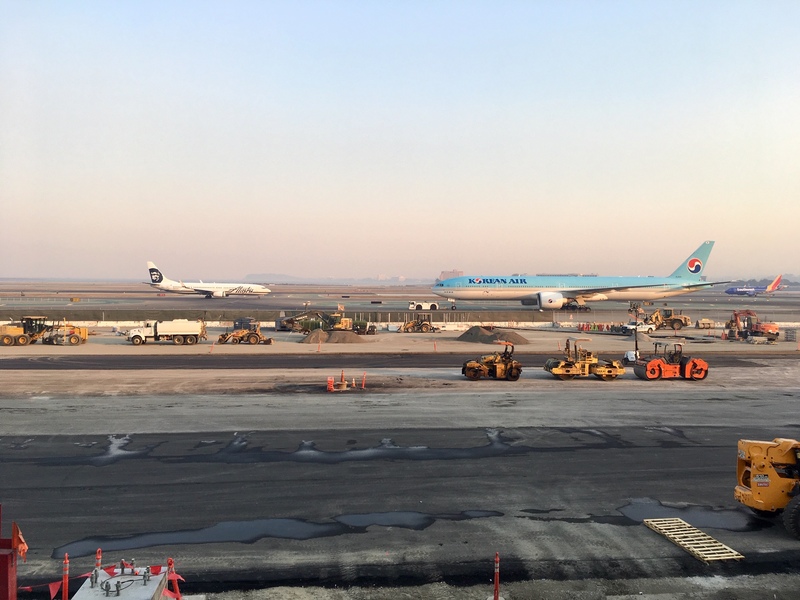 Our airlines and companies data does not always not reflect all the ways the airline industry has grown and morphed over the years but our goal is, in time, to capture that history. Like most museum collections metadata there will be some hiccups. It’s important to point out that this is nothing more than a reflection of the constraints and demands that the sector has operated under long before the Internet and all its fancy databases showed up. It is important to remember that everything we, and every other museum out there, have accomplished has been done on the back of this “imperfect” data. Where there is “weird data” we will fix it. The ability of the Who’s On First model to inaccurate or bunk data as well as the evolution and changes of a place, by way of the wof:deprecated and wof:superseded_by properties, were important considerations when choosing to use it to describe airlines and companies. 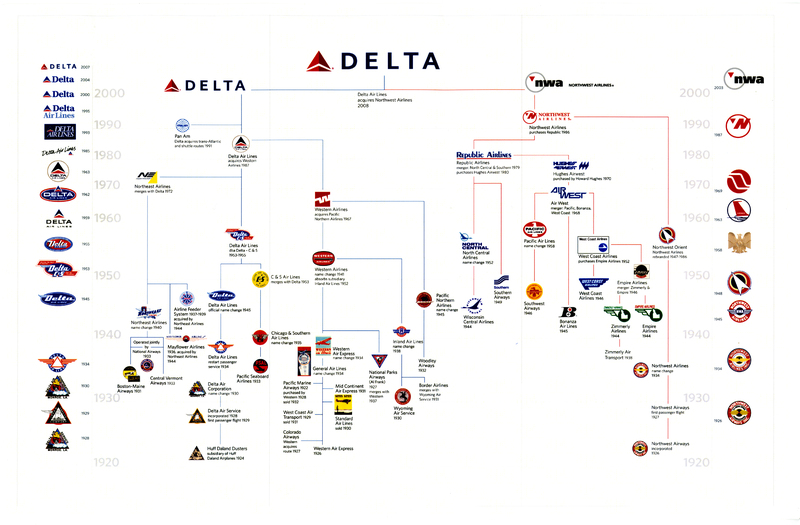 So, how do we model the relationship between airlines and companies? Dependent \De*pend"ent\, a. [L. dependens, -entis, p. pr. 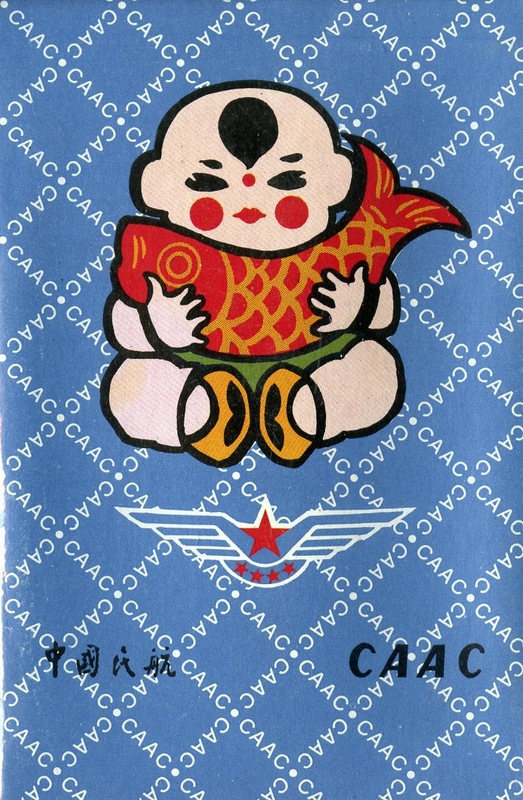 Airlines are parented by localities or countries and subordinate to companies. Companies are parented by localities or countries and may be subordinate to other companies. There is no limit on how deep a subordinate-chain can be or its directionality which, it seems, is a pretty accurate reflection of how companies and corporations actually structure themselves in 2018. There will undoubtedly be some edge cases whose nuances we don’t capture with this model but it feels like a good place to start. Sometimes, the question is asked: Why not just use Wikipedia (or Wikidata) identifiers for things like airlines or companies rather than minting even more pointers for what everyone agrees is the same thing? It’s a reasonable question given the scope and the breadth, not to mention the quality, of the work Wikipedians have done. This is especially true when it comes to airlines, it turns out. The answer is as important as it is simple: SFO Museum needs to be its own “source of truth” for the things in its collection. At the end of the day we need to be able to exercise editorial interpretation, bias and control according the museum’s own guidelines and practices and not those of Wikipedia (or any other project). We also need a measure of stability in our identifiers that other sources may not need or provide. For example, I recently discovered that the same International Air Transport Association (IATA) code (CZ) has been used for two completely different airlines, over the years. But we would like to hold hands with Wikipedia and, where it’s appropriate, we would be happy and grateful to supplement missing data in our records with data from their records, notably dates and international aviation codes and callsigns. 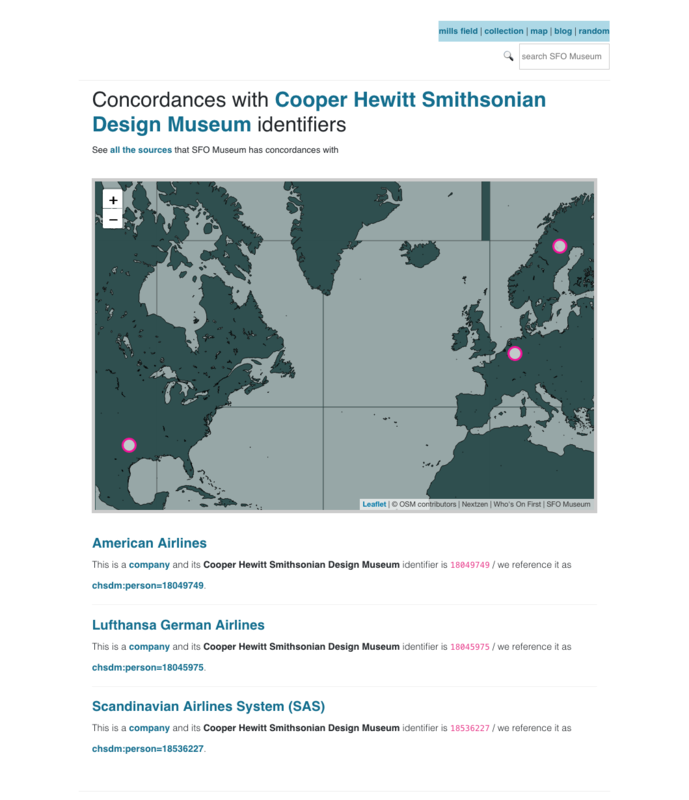 Concordances are great because, selfishly, we want to make sure that even if you don’t use our identifiers for things that there is always an avenue back to our collection regardless of whose identifiers you use. They are also great because debate, in the friendliest sense of the word, is the bed rock on which cultural heritage and the humanities rests so offering people a multiplicity of views and understandings about a subject seems like a generally good thing. 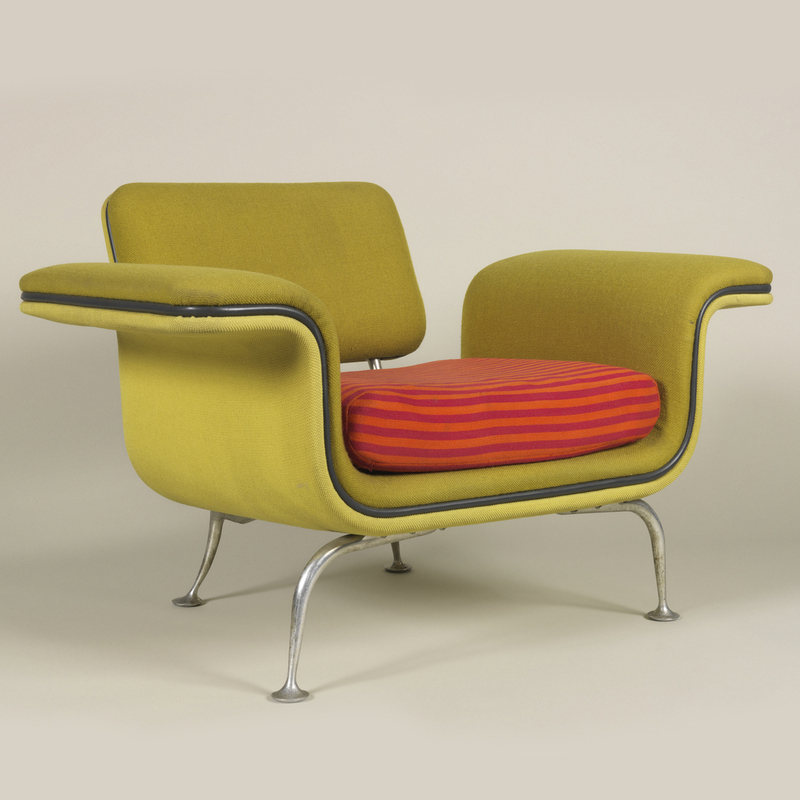 We especially want to establish concordances between our collection and other museum collections. 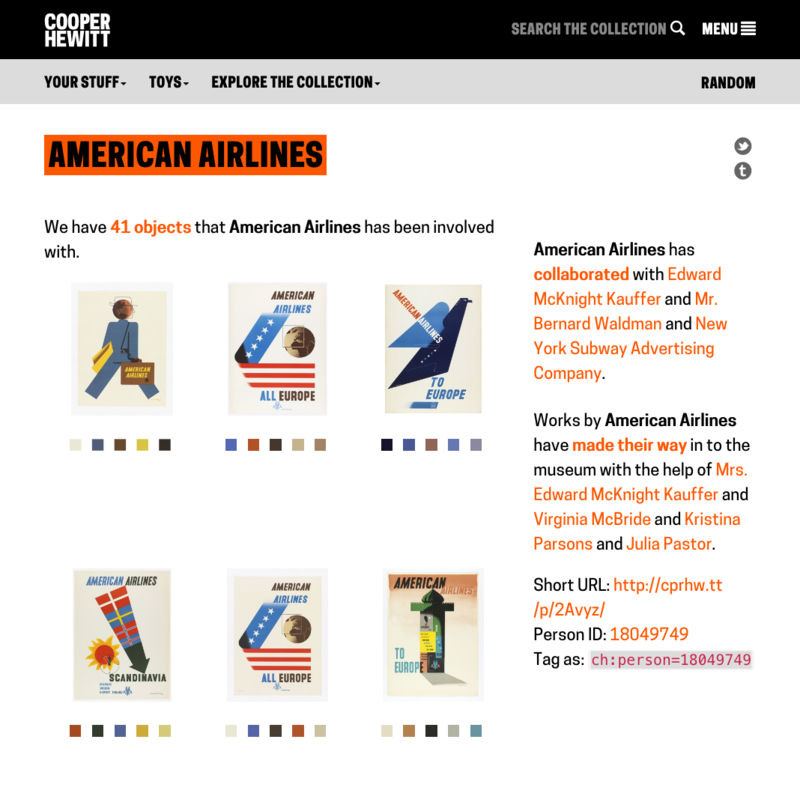 For example, we know that our American Airlines is the same as the Cooper Hewitt Smithsonian Design Museum’s American Airlines and they have all kinds of amazing objects related to the airline in their collection. Why wouldn’t we want you to see them? We haven’t talked much about people in the context of the SFO Museum collection yet but like the objects they are involved they are radidly coming in to focus. 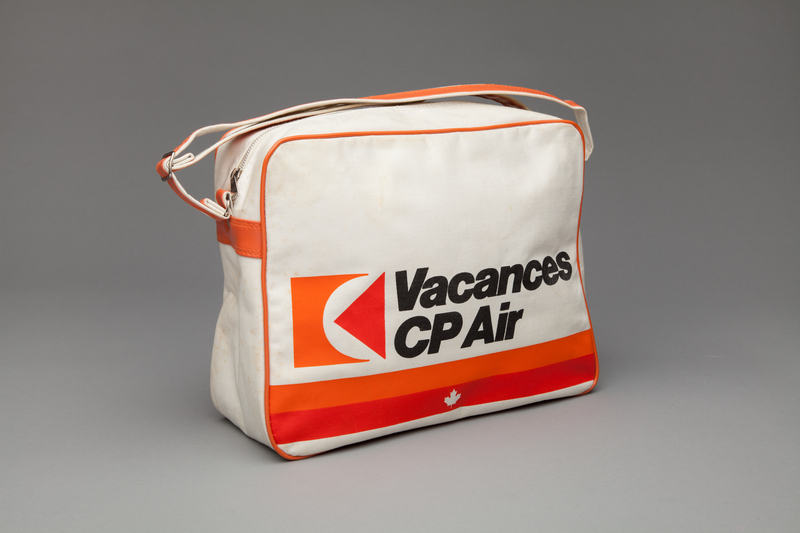 Alexander Girard (not mention Braniff Airways) for instance. 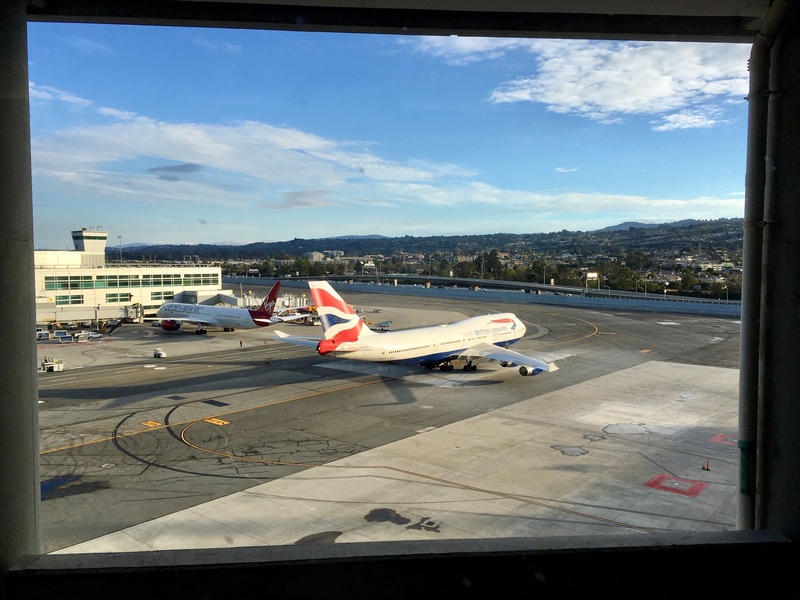 We think “people” (and airlines and companies) will be an especially rich source of concordances with other museum collections given how many individuals, from all walks of life and across the professional spectrum, are involved with all the things SFO Museum is interested in.